Work by Matthias C. Rillig, Lisa Ziersch, and Stefan Hempel at Freie Universität and Brandenburg Institute of Advanced Biodiversity Research in Berlin has been published in an article titled Microplastic transport in soil by earthworms. This article investigates earthworms effect on microplastic movement into subsurface soil layers. With the increase in plastic usage in recent decades the issue of how this discarded plastic will affect marine environments has been studied extensively. However, effects of microplastics on soil environments have not been tested to the same extent. 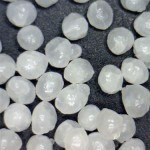 Scientists have begun testing microplastic movement into lower soil layers by analyzing how differing sized polyethylene beads moved in a 21-day period with and without earthworm facilitation. The experiment was designed to confirm the assumption that earthworms would aid in particle movement. Results found earthworms to have a significant positive effect on transporting polyethylene particles from the soil surface. While particle size was also an important factor on the level of transportation into subsurface environments. With polyethylene spheres in the size range 710-850um being significantly more likely to move into the lowest layer when earthworms were present. With this experiment showing the ability of earthworms to transport microplastics into subsurface layers more research needs to be done to determine the effects this may have on the soil environment and the worms themselves. Including the multitude of other organisms that could also facilitate similar transportation. As well as the possibilities of microplastics reaching ground water where problems similar to those realized in marine systems could occur.